Although this topic falls outside of my usual interest in 19th Century or earlier, Manx affairs, I have included it as a possible help for those of non-Manx descent. The Isle of Man was used as a base for Alien Civilian Internment camps in both WWI (1914-18) and again in WWII (1939-45); for WWI a very large camp (effectively a small, self-contained, township) was established at Knockaloe, Patrick, on the west coast near Peel. This camp was for male internees - women were not interned. There was another smaller camp at Douglas. In WWII existing property, mostly requistioned bed and breakfast houses or hotels, were cordoned off and used as a series of 'camp's - different camps catered for different nationalities - women and children were housed around Port Erin and Port St Mary in the south of the Island which had controlled access from the rest of the Island, UK Fascists and Italians were interned at Peel and a section of central Douglas promenade was cordoned off for use as a series of male camps. In both wars these camps were under British Goverment control; all records relating to them are (or were) held in London - see addresses at end. It seems that all the personal files relating to WWI internees held by the British Goverment were destroyed, probably by accident, during the 1970s. The original card index was destroyed by enemy action in WWII. However the Geneva based Red Cross has records derived from UK weekly returns of internees and POW's some of which are now online. No records were kept on the Island though there are many incidental records, not all indexed, kept by for example the Island police force that are now in the Manx Museum Library.. Originally intended to house 5,000 internees, by the end of the war some 24,500 were held there. It was built from woodern huts, covered 22 acres, split into 23 compounds divided between 4 camps each of which had its own hospital, theatre etc. There were camp printing presses and some very skilled work was done, as seen in the steel engraving of the camp - Patrick Church is seen right edge - Corrins tower overlooking Peel can be seen left background. The camp had its own specially constructed rail-link over which the food etc was brought into the camp. 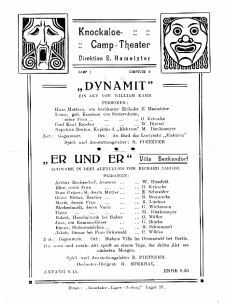 An example of both the sort of self-produced entertainment and the use of camp printing press (this example camp 4) is shown in the theatre poster. 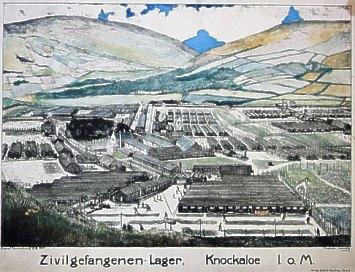 Knockaloe had the reputation of being the worse camp - possibly a class attitude as many 'gentleman' internees (i.e. those who had enough private means to support additional benefits) sought transfer to other camps (eg Douglas or Wakefield) - this attitude can be seen in the account by Cohen-Portheim. The camp gained something of a reputation as a socialist camp. Some degree of the homesickness felt by the internees can be seen in the 1917 Christmas card produced in the camp. Hartmann planned and edited a camp newspaper - however this would not appear to have progressed past the first issue of 4 pages dated Easter 1915 - this was printed ouside the camp by a local printer W J Clarke of Michael Street Peel - my proof copy of the first issue has many corrections by Hartmann to the printer. The closure of the camp was not until late 1919 - this long period post hostilities was a major cause of depression amongst the inmates. After the war the camp returned to its pre-war farm use - but this time as Knockaloe experimental agricultural station but this has now ceased and the farm returned to standard agricultural use.. Most of the internees were deported, many unwillingly as they had British wives and/or had settled in Britain pre-war. (Postwar with so many dead I suppose tribunals were not disposed to be kind, though there was also a newspaper-led movement to force such deportation). Some idea of the immediate post-war treatment can be gleaned from Hall Caines novel Woman of Knockaloe set at Knockaloe farm. Over 250 died in captivity - these were interred at Patrick church yard. In 1962 their remains were removed and re-interred at Cannock Chase, the gravestones were destroyed. However a few, (2 Jewish internees) and 6 Turkish graves remain. See 1921 article for a description. The Manx Museum has a short, free, factsheet (factsheet No 1) available on request (also on-line at their website) ; the addresses given below are extracted from this. The factsheet is mostly given over to a bibliography. For WWI , the Anglo-German Family History Society has published several booklets which give some background information and/or diaries etc of camp internees. Living with the Wire: Civilian Internment in the Isle of Man during the the two world wars Douglas: Manx National Heritage, 1994 (ISBN 0-901106-35-6) - a short but informative booklet, originally written to accompany an exhibition at the Manx Museum, however the revised edition 2010 (ISBN 0-901106-63-6) has been considerably expanded(especially re WW2) with much more information including discussion of the art of some of the Jewish internees of WW2 (based on a 2009 exhibition) - well recommended. M. West Island at War Laxey:Western Books (Author's own publication), 1986 (ISBN 0-9511512-0-7) - deals mainly with those who fought in WWI (includes list of all those killed on active service) but has three chapters giving an historical account of Knockaloe. Has many illustrations and some details of internees - probably the best account, although as no references are given it is not easy to verify any details. Should still be available from Island bookshops. Mathew Richardson This Terrible Ordeal Manx Letters, Diaries and Memories of the Great War Douglas:Manx National Heritage 2013 (ISBN 978-0-901106-67-4) Chapter 3 "The Torment of Captivity" offers an excellent discussion on how the internment camps at Douglas and Knockaloe were viewed by all parties. Very many photographs exist of various aspects of WWI camp life - very few photographs however exist of WWII camps or camp-life. The Manx Museum Library probably has the best collection. Alan Franklin Involuntary Guests Ramsey Lily Publications (ISBN 978-1-911177-33-3) 2017 - written by the now retired Manx Museum Librarian and based on post-graduate research; probably the most comprehensive account to appear covering all the WW2 camps with many illustrations including various official documents with excellent references. C. Chappell Island of Barbed Wire London:Corgi 1984 (ISBN 0-552-12712-4) - good illustrated account of the camps. P & L Gillman Collar the Lot: How Britain interned and expelled its wartime refugees London:Quartet Books, 1980 (ISBN 0-7043-2244-7) out of print - not explicitly concerned with the Manx Camps (though naturally these are covered) but concerned with the wider picture. 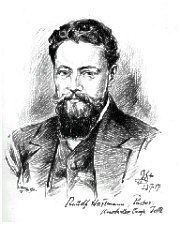 L.N. Giovannelli Paper Hero Douglas: Island Development Co 1971 - 'Barone' (self given title) Giovannelli was an Italian Internee during WW2 - he later returned and settled for a time on the Island - the book gives an interesting description both of Douglas camp (the Metropole) and also of his work on Manx farms. Our Heritage: Book 2 - More Memories of the Past in Rushen Port St May: P.P. Mrs Kate Rodgers nd [c.1993] includes several short reminiscences of life both for children and interned aliens at the Women's camp in Port St Mary. They also have a webpage on the very impressive Federation of Eastern European Family History Societies web site.